An amazing entree. A magnificent main. A transcendent dessert. Followed by a mediocre mocca. That has been the disheartening trajectory of Michelin meals for years. 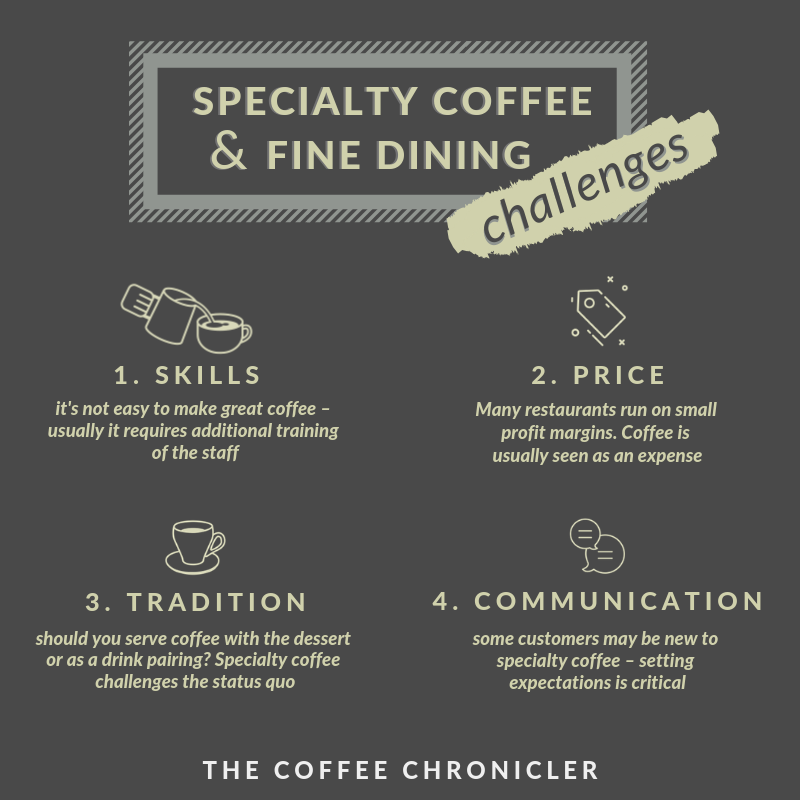 Coffee professionals have often criticized the coffee at top restaurants, and in the past, they may have had a valid point. I reached out to all the restaurants on the venerable ‘The World’s Top 50 Restaurants‘ list to find out if that is still the case today. It turns out that the crème de la crème of fine-dining certainly puts effort into the cup. 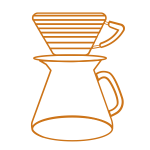 75 % of the surveyed restaurants opted for smaller, local roasters instead of multinational giants. Three restaurants relied on Lavazza and two used Illy. Only a single restaurant used the Nespresso system. 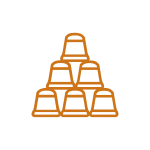 However, 20 % also used non-standard brewing methods (i.e. other methods than espresso or drip). Below, you can see a detailed list, lining out precisely what kind of coffee you can expect in each restaurant. If you want to skip the details and go to the broader perspectives and interviews, you can jump directly to the background article by clicking here. Also, you are free to download the list and embed it on your own site. Just click the link below, right click and choose “Save as”. However, I would appreciate, if you reference this page. Please Note: The numeral next to the restaurant name corresponds to the 2018 placement on the ‘World’s 50 Best’ list. Since only 25 of the restaurants were able to participate in this article, there will be some gaps. Notes: Massimo Bottura’s restaurant, which is currently considered the best in the World, uses Lavazza’s premium ‘Kafa Forest’ bean hailing from the Ethiopian region of the same name. Notes: Mirazur is located right on the French side of the border with Italy. The restaurant works with Difference Coffee Company and currently offers Kona coffee from Hawaii brewed on an espresso machine. In the future, a collaboration with the roaster Coffeel at the Italian side of the border is in the works. Notes: Asador Etxebarri works with the roaster Ditare Kafe, also hailing from the Basque region of Spain, and mainly uses a blend consisting of Brazilian Bourbon, Kenya AA Plus Kagere and Monsoon Malabar from India. The restaurant also offers an organic decaf option from Mexico. Notes: Quintonil has used Café Cobalto, an artisan specialty coffee roaster based in Veracruz and Mexico City, since 2014. The coffee served in the restaurant is grown at the foothills of the Nevado de Colima volcano. Besides espresso, Quintonil serves a special Mexican kind of coffee called café de olla. Typically, it consists of coffee boiled in a traditional claypot with condiments such as raw sugar and cinnamon. Notes: Pujol supports the local Mexican coffee scene by working with Buna; a third wave coffee company founded in Mexico City in 2012. The restaurant serves both espresso-based drinks and traditional drip coffee. Notes: Geranium works directly with the renowned third wave roaster The Coffee Collective who produces a special roast for the restaurant. It’s a bit more developed than their usual ultra-light Nordic roast. The coffee is brewed tableside on either the Kalita Wave or the Rok, which is a manual, non-electric espresso maker that looks a bit like a giant walnut cracker. Notes: Attica works with the specialty roaster Market Lane Coffee. 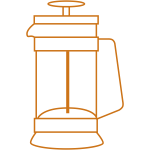 The Espro Press is a new interpretation of the classic French press. It uses a unique filtration system, so you don’t get any sediment in the cup. It is also capable of keeping the coffee warm for an extended period. Notes: Alain Ducasse au Plaza Athénée serves coffees roasted in-house by Veda Viraswami; the reigning roasting champion of France. For drip coffee, the restaurant uses a blend of beans from Ethiopia, Burundi & Congo. For espresso, the blend consists of beans from Ethiopia, Laos & Brazil. Notes: The roaster of the coffee is Sergio Coimbra from Brazil, who also happens to be a well-known food photographer. The coffee is from the Jacarandá coffee farm located in the Brazilian state of Minas Gerais. Notes: In all of the ‘Alajmo family’ restaurants the coffee is sourced and roasted by Gianni Frasi; an Italian coffee roaster from Verona who owns Torrefazione Giamaica Caffè. The blend is created specifically for the restaurant, and it consists of beans from different regions of Indonesia. Notes: Ultraviolet maintains a close relationship with Nespresso, whom chef Paul Pairet is also an ambassador for. Ultraviolet offers capsule coffee from Tanzania, Brazil, and India. The machine is a commercial grade Nespresso Aguila AG220. Notes: Cosme is a Mexican-inspired restaurant located on Manhattan. True to their origin, they use single origin Mexican coffee roasted by specialty coffee roasters Buna from Mexico City. Notes: Odette is a stunning French restaurant located in the national gallery of Singapore. The coffee is supplied by local third wave roaster Papa Palheta. Notes: At Tickets the coffee blend currently in use is ‘Lavazza Pienaroma’. 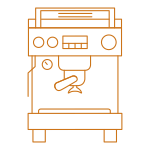 The restaurant recently switched to an espresso machine produced by Iberital Vision, which is an innovative company also based in Barcelona. In 2019 the restaurant will add Hario V60 and Chemex to the coffee program. Notes: Maaemo has garnered much attention for its coffee programme in recent years. 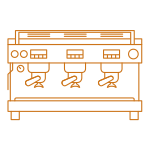 Earlier the restaurant was using Norwegian-style cowboy coffee (koke kaffe), but nowadays the method of choice is drip coffee brewed on a machine from the Norwegian homeware brand Wilfa. The roaster is also from Norway; the renowned Tim Wendelboe who has previously won the Barista World Championship. Notes: Reale’s coffee program is in line with the Italian heritage. A special blend from illy is served, and the brew method is espresso. Notes: Tim Raue’s eponymous restaurant gets its beans from Andraschko; a roaster established in Berlin in 1979. The brewing method is espresso. Notes: Lyle’s has an extraordinary focus on coffee. The restaurant cycles through more than twelve different European roasters including Koppi, Square Mile, Bonanza, Assembly, Clifton, and many others. Espressos are decanted, so they have very little crema when they are served, and filter coffee is brewed with the deceptively simple Clever Dripper. Notes: The Peruvian restaurant works with the local roaster Bisetti, which has been around since 1958. 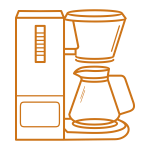 Only local coffee is served, and the brewing method is espresso. Notes: The Parisian restaurant gets its beans from the Italian roaster Trinci; a family company that started out in Florence in 1939. The espresso machine is from Faema. Notes: Mikla uses beans from the local third wave roaster Kronotrop. Interestingly, the restaurant offers traditional Turkish coffee, which consists of unfiltered, finely ground coffee boiled in a narrow kettle called a cezve. Notes: Nahm serves espresso-based coffee from the Italian company illy. However, we hope to see the restaurant transition to a bean grown by one of the many ambitious coffee farmers in Thailand in the future. Notes: The Test Kitchen uses a pulped natural bean from Fazenda Recreio, Brazil, that works both as straight espresso or with milk. In the past, the restaurant has also incorporated fruit-forward Kenyan coffees in desserts. Why Can't restaurants make good coffee? Traditionally, coffee hasn’t been a priority in top restaurants. But a new generation of coffee loving chefs and sommeliers may change that. 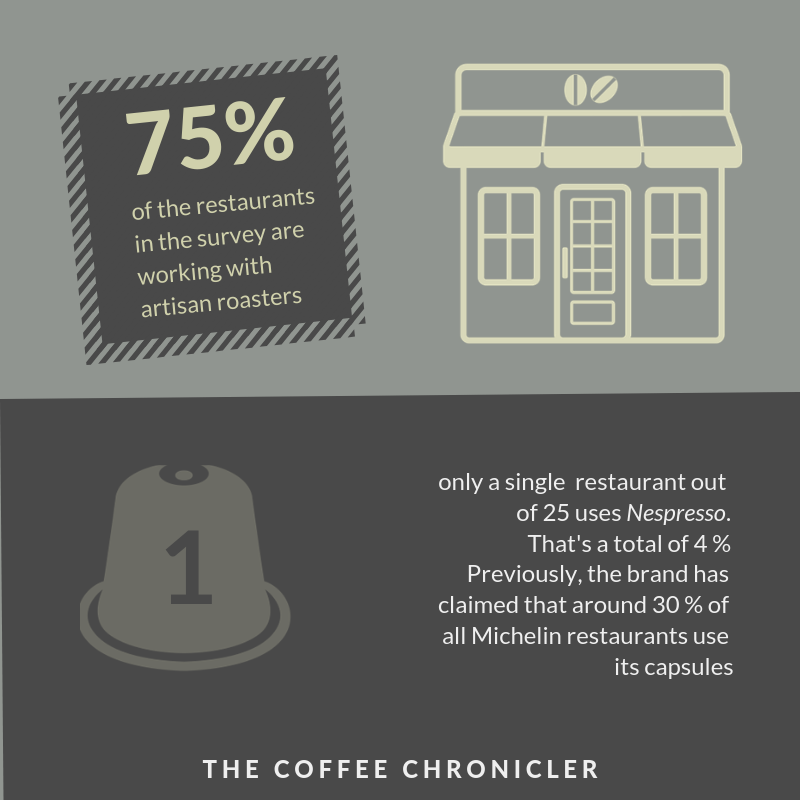 In 2013 Nestlé claimed that 30 percent of the around 2400 Michelin restaurants in the world used the company’s ubiquitous capsule espresso (source). That’s not to say that Nespresso is bad coffee – it’s certainly better than the average Joe you’d encounter in everyday life. However, in a fine dining context where chefs put utmost care in procuring the right produce and cooking everything a la minute, it does seem underwhelming to serve a homogenized product that’s available in most supermarkets. In 2013 the Danish restaurant Noma, back then widely considered the best restaurant in the world, launched a coffee program consisting solely of single origin coffee from roaster Tim Wendelboe brewed with the Japanese pour-over cone, Hario V60. Back then it was considered something akin to a revolution. The transition was met with equal parts acclaim and skepticism. Today, however, it turns out that many of the restaurants at Noma’s level have transitioned from commercial coffee towards specialty coffee. I reached out to all the restaurants on the ‘The World’s 50 Best’ list to find out not only what kind of coffee they served but also how they brewed it. A bit more than half of the restaurants participated in the survey, and the results were somewhat surprising. 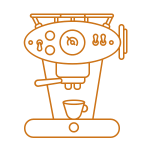 More than 75 percent of the restaurants were relying on artisan roasters to supply their beans rather than multinational companies, and only a single restaurant used Nespresso. 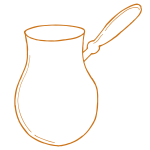 A handful even used brewing methods normally associated with specialty coffee. Geranium; a three Michelin-star restaurant in Copenhagen, is one of the places that has moved towards specialty coffee. “We realized that pour over coffee is a better fit with our restaurant experience in general,” Søren Ledet, the restaurant manager, and co-owner explains to me. 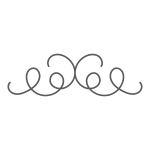 “We use the Kalita Wave and brew the coffee tableside in front of the guests. For me, the smell and the brewing process is an integral part of coffee. We don’t want to deprive our guests of that. For us, it’s also a great way to have the final connection with the customers and get their feedback on the meal,” the Danish restaurateur says. 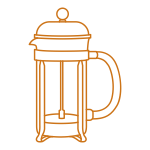 “Back when we just started, we used brewing methods such as the French press and had an expensive espresso machine, because that was just the way you did it back then. However, within the last five years so much has happened within specialty coffee,” Søren Ledet says. Out of the 25 restaurants that participated in the survey all except four serve traditional espresso and espresso-based drinks (note that one of the four serves Nespresso). 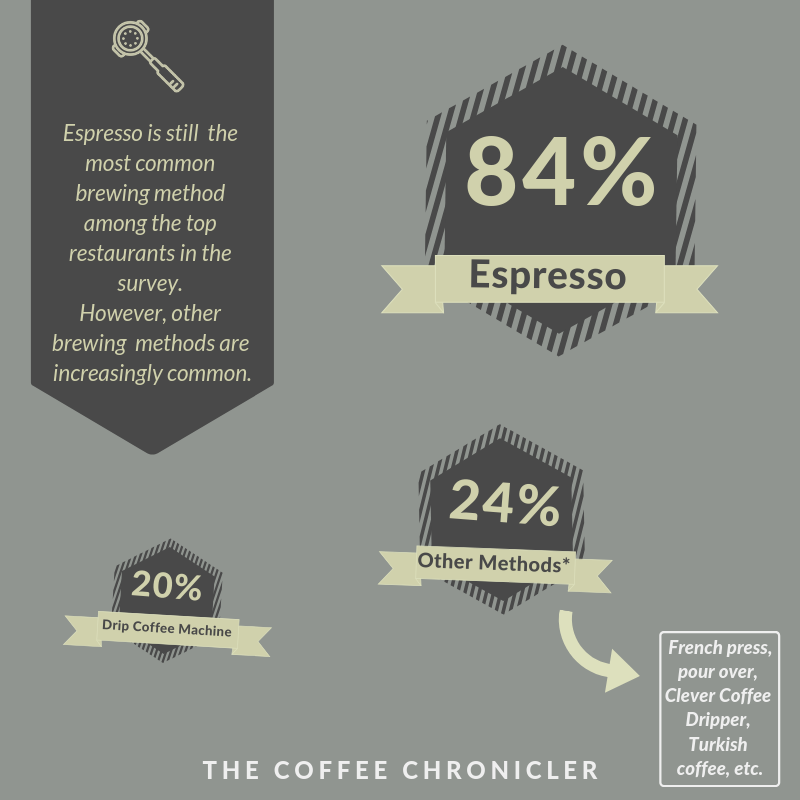 It’s worth pointing out, however, that espresso isn’t an indicator of quality in itself. The beans are just as important as the brewing method. Traditionally, espresso was regarded as somehow more ‘refined’ than other options but today most of the world’s barista elite are equally fond of pour over and other more down-to-earth ways of preparing coffee. Maaemo from Norway is one of the restaurants that has ditched espresso altogether. Instead, the restaurant is sporting a truly patriotic line-up, relying on the local, legendary roaster Tim Wendelboe to deliver the beans and a drip coffee maker from the Norwegian brand Wilfa. Among foodies, the so-called locavore trend, which dictates that produce should be sourced locally, has been dominant in recent years. With coffee, this is more challenging, however, since the plant, coffea arabica, only thrives near the Equator. However, the restaurants from coffee growing countries such as Peru and Mexico I spoke with for this article all use locally grown beans. Quintonil from Mexico City pointed out to me that they only use coffee grown at the foothills of the Nevado de Colima volcano. The restaurant also offers a traditional Mexican preparation called ‘café de Olla’ where ground coffee, cinnamon, and unrefined cane sugar are served together in a clay pot. Likewise, Astrid y Gaston from Peru mentioned that they only use Peruvian coffee. Unfortunately, the restaurants from Thailand and China don’t use local beans, even though both countries have taken massive leaps in terms of coffee quality within the last five years. 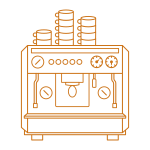 Another interesting find was that a majority of the surveyed restaurants opted for smaller, local roasters instead of the multinational giants. As mentioned before only a single restaurant used the Nespresso system. Three restaurants relied on Lavazza and two used Illy. However, the remaining 19 restaurants all worked with artisan roasters. 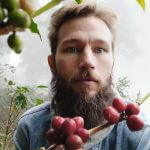 Being curious about whether this trend was noticeable not just in fine dining, but across all restaurants, I reached out to the coffee market adviser Andrew Hetzel, who has been working in coffee for two decades and is a member of the Board of Directors of the Specialty Coffee Association. 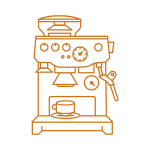 “Back in the day, it wasn’t uncommon that restaurants got their coffee from companies that also sold janitorial supplies along with a machine that was provided for free. 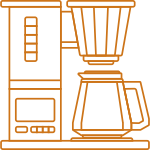 After being brewed, restaurant coffee would be left on the burner for many hours. Now, it seems most restaurants at least have some thoughts about what the interaction is between coffee and meal,” Mr. Hetzel says. However, there is still room for improvement, according to the consultant. 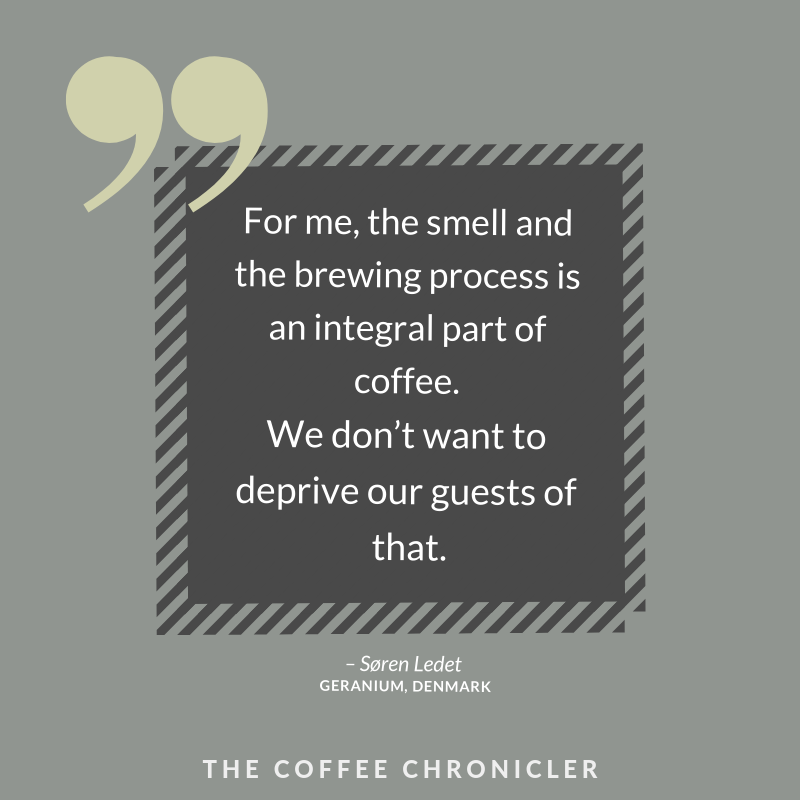 The sentiment that too many restaurants are skimping on the coffee offering is echoed by Søren Ledet of Geranium. “There are still too many good restaurants that don’t take coffee seriously,” he says. “Either they use low-quality beans or don’t put enough effort into the brewing process. Having said that, I think the quality of the beans themselves is the most important aspect, and honestly, it’s not difficult to find an excellent roaster nowadays. Here in Denmark, we have plenty, and if you don’t like the ones in your local area, it’s simple to get coffee shipped from abroad,” says Søren Ledet, who himself gets his beans from renowned Copenhagen-based ‘The Coffee Collective’. Another restaurant that isn’t lacking behind the specialty scene is Lyle’s in London. In fact, the establishment was recently listed as ‘one of the essential coffee spots of London’ by Eater even though it’s a Michelin-star restaurant and not a café. Lyle’s doesn’t limit themselves by just collaborating with a single roaster. Instead, the restaurant cycles through a bunch of European favorites. There’s Koppi from Sweden, Square Mile from England, and Bonanza from Berlin and many more. “Espressos are decanted so they have very little crema when they are put in front of the guests, and filter coffee is served from the Clever Dripper into a carafe with a cup and saucer for presentation. This helps us heighten its status to the guest and basically removes any insistence for adding milk,” head barista James Low explains via e-mail. In spite of Lyle’s impressive coffee repertoire, James Low isn’t a big fan of pairing coffee and savory dishes. “I am of the opinion coffee cannot work with food unless it’s breakfast or petit fours at the end of a meal,” he adds. At Geranium in Denmark Søren Ledet is more open to the idea of combining coffee and food. “I think it’s viable. At the moment we haven’t paired coffee with savory dishes, but we do it with tea,” he says. “At Geranium, we haven’t opened that Pandora’s box of options yet, but eventually we might. I can easily envision a cold brew with one of our desserts, or as a part of our non-alcoholic pairings,” he explains. So should we get used to combining foie gras, truffles, and a Yirgacheffe, when we go out to dine? According to Andrew Hetzel that’s probably not going to happen any time soon. Right now the respective cultures of specialty coffee and fine dining are too dissimilar. 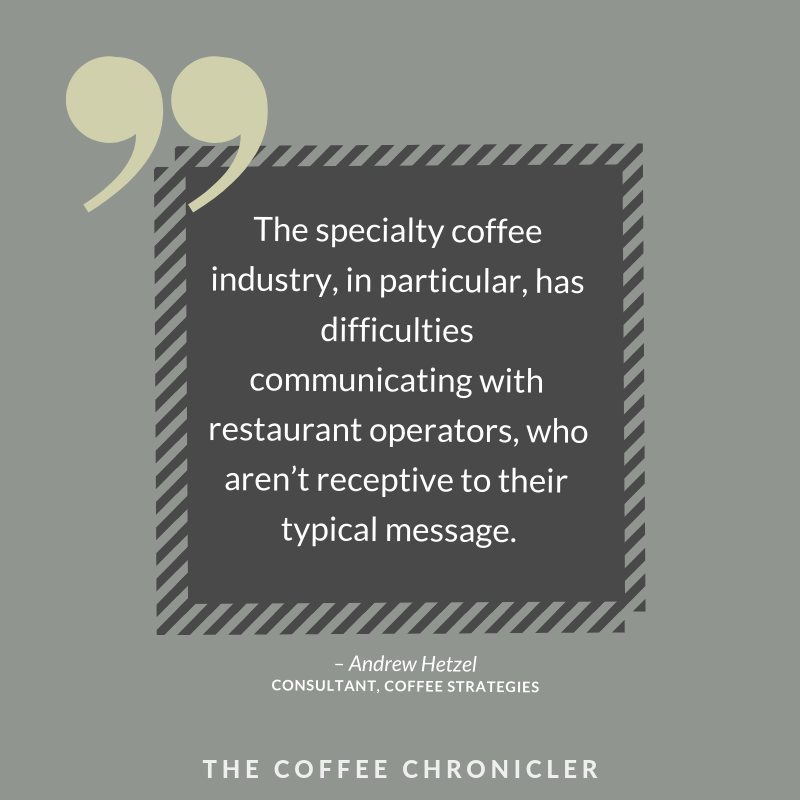 “The specialty coffee industry, in particular, has difficulties communicating with restaurant operators, who aren’t receptive to their typical message. One of my clients has been successful in getting many restaurant accounts, but this is because he understands the formality and culture of the restaurant business,” he explains. “There are also regional differences. Australia is a place where specialty coffee is a part of the prevailing culture, and that has seeped into the restaurants as well. Melbourne is one of the few places in the world where I’d feel confident ordering coffee after a meal at a restaurant I haven’t been to before,” Mr. Hetzel says. Andrew Hetzel mentions that there is also likely to be a generational gap between both customers and decision makers in coffee and fine dining. “Young people are a major driver of the specialty coffee industry at the moment – both when it comes to customers and the people who work behind the bar. As those consumers age and get more disposable income there will probably be more of an overlap with the customers at fine dining restaurants,” he says. 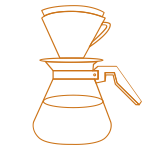 How do you brew coffee at your restaurant? More than half of the restaurants replied, sharing details about their coffee program. There were also some unexpected answers; in one instance, a restaurant didn’t serve coffee but instead chose to focus on tea as it was more in line with the spirit of the place. Others were in the middle of a transition phase, changing coffee roaster and method. In the end that left me with the 25 restaurants you see in this article.